All businesses need to be flexible. This means having the ability to expand or move their property whenever business plans change. Having a security booth is no different. By choosing modular security booths, you can easily find the best places to put your booths and move them in an effective manner. This helps you to protect your assets and property in an affordable, practical way. There are several different kinds of guard booths available online. 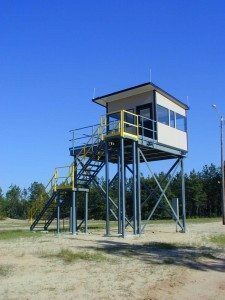 Finding a guard booth that is right for your business can be easy when you work with the right company. A Panel Built guard booth, for example, can be customized in several different ways. This allows you to match the exact style that you want without all of the hassles. Purchasinga a prefabricated guard house is also important. Prefabricated means that it is built away from your business and then delivered. This means you don’t have to watch over a construction crew or worry about an unsightly mess. All of the guard houses are delivered intact and ready to use. One of the biggest benefits of Panel Built is that it is cost effective. Each prefabricated guard shack is created quicker, so you don’t have to worry about downtime. The fast construction doesn’t mean a lack of quality either. Each guard shack is made with durable materials that offer you an overall outstanding quality and value. Normally, a security booth would be a very costly addition to your business. There are typically high maintenance fees that go along with a traditional security booth. Unlike these costly security booths, every guard house by Panel Built works to have low ongoing maintenance costs. Because only the most durable materials are being used, the metal building will be resistant to rust and corrosion. Each guard shack is also built to withstand even the toughest weather. The buildings are naturally resistant to high winds, cold, heat and excessive water. Each structure can withstand some earthquakes and hurricanes. This helps to reassure you that your modular guard house will always be there. Choosing something that is portable is never easy. Some businesses feel that having a permanent establishment adds to the property value. In fact, the opposite is true. Portable guard houses can be a great addition to a pending sale or you can take them with you when you move. This gives you more control over your investment. The portable guard shacks can also be expanded without any difficulty. For example, if your future business plan includes an office building, you can easily attach prefabricated offices to your existing structure. This allows you to grow with your business in a hassle-free way! Your portable guard houses can also be made to look like almost anything. A variety of siding, colors, door and window options allow you to find something that meets the theme of your business. If desired, your guard booth can even look like a small house. On the inside, you can add electrical, water and plumbing options so that your staff members do not have to leave their post. This can make for happier guards and a more secure premise. The sky is truly the limit when you work with an experienced company like Panel Built for your metal guard houses. When looking for prefabricated guard booths available for sale online, it is important to find a company that is well-known for producing quality modular buildings. Prefabricated guard houses can vary quite a bit, depending on which company produced them. 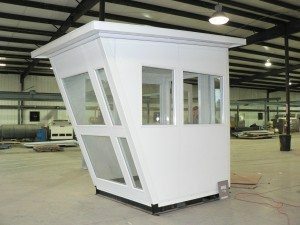 In order to get all of the benefits of prefabricated security guard houses, you will need to work with a reputable company like Panel Built. Panel Built prefabricated guard houses are suitable for any industry, including commercial and military uses. Because layouts can be customized, they are an excellent solution for those with space management concerns. The buildings are all pre-assembled in a timely fashion, so they can work as an immediate solution. Custom projects are also available upon request. While most security offices won’t need extra storage spaces, office cubicles or sub-station enclosures, it is important to remember that anything is possible with Panel Built guard shacks. Every structure can be fully customized by a team of experts willing to offer you personalized attention. This helps you to create an external structure that you can really take advantage of. Panel Built works hard to create several different kinds of projects, not just prefabricated security guard booths. In fact, many businesses choose to partner with them for additional buildings or systems. These portable structures are always considered an asset, even if they are fully customized to suit a business’ needs. One of the best things about Panel Built is that they have nearly two decades of experience creating pre-manufactured buildings. They offer a complete line of custom buildings, each one built in one of their state-of-the-art facilities. They work to provide you with total customer satisfaction on every project. If you are in need of a security guard booth or you are ready to learn more about this excellent business investment, contact Panel Built today.